GCR Statement of Interest: "This is the type section of the Permian Tor Bay Breccias. These here include a variety of fluvial breccias, in which types formed during ephemeral sheet floods are the most abundant. On the south side of the headland are interbedded aeolian sands showing palaeowind directions towards the north-west. 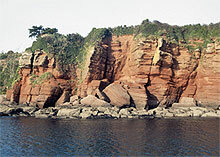 This contrasts with the directions of fluvial transport, deduced from sedimentary structures such as imbrication and cross-bedding in the breccias, which was towards the south-east. A key site for demonstrating Permian sedimentary environments."